Beijing is an intimate and informed portrait of a city at the centre of one of the world’s oldest civilizations and the capital of one of its newest superpowers. For hundreds of thousands of years, humans and their ancestors – Peking Man among them – have lived here. Over three and a half millennia, cities have risen and fallen in this place, five of them the capitals of dynastic empires. For centuries the stage for sieges, massacres, rebellions and political spectacle, Beijing has produced or inspired some of China’s greatest and most iconic works of literature, theatre and music. At this book’s heart is a concise, lively history of the city, full of big and charismatic personalities and dramatic events. Thought-provoking essays on topics ranging from the elemental problems of water and air to the vibrant art scene and the architectural adventurism of the city’s ‘hyperbuildings’ take the reader to the shores of the city’s lakes, down into its subway system and through its bustling art districts. 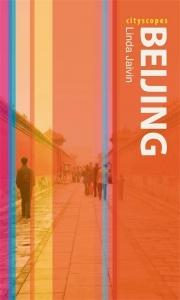 Generously illustrated with modern photographs and compelling historical images and containing a number of useful listings, Beijing is the ultimate introduction to this extraordinary city for travellers and general readers alike. Linda Jaivin interviewed on Australian Broadcasting Corporation’s The World. Here also from popupchinese.com is a lively discussion between Jeremy Goldkorn, Geremie Barme and Linda Jaivin on China in the 1970s, 1980s and 1990s, the decades in which they first visited China. Please wait for the mp3 file to load, or to go to the website click here. Linda Jaivin is a novelist, essayist, translator (from Chinese) and playwright, and a regular visitor to and occasional resident of Beijing since 1980. Her books include Eat Me (1995), A Most Immoral Woman (2009), The Monkey and the Dragon (2001) and New Ghosts, Old Dreams: Chinese Rebel Voices (co-edited with Geremie Barmé, 1992). She lives in Sydney.